Last month, India started producing coal at a new mine in Magadh that it hopes will be Asia’s largest coal mine in five years. The coal mine, located on 44,500 acres, will supply a large power plant being built nearby. A second large coal mine was opened last year about 20 kilometers away and another two mines will open nearby by 2018. Combined, the mines in this one district are expected to produce as much coal as Poland–the world’s ninth largest coal producer. Indian coal typically has high ash, low sulfur content, and a low-to-medium calorific value. Because of its low-quality, twice as much Indian coal is needed to produce the same amount of energy as the best Australian coal. If India burns as much coal by 2020 as planned, its carbon dioxide emissions could as much as double to 5.2 billion metric tons per year — about a sixth of all the carbon dioxide released into the atmosphere last year. According to the World Coal Association, China, India and Indonesia consume 71 percent of the world’s newly mined coal. Other Asian nations are also looking to power their economies with coal. For example, Pakistan, the Philippines and Vietnam are opening new coal plants. The Asia/Pacific region accounts for 80 percent of new coal-fired power plants globally. Japan’s coal consumption reached a record after it closed its nuclear units due to the accident at Fukushima caused by the tsunami and it plans to build another 41 new coal-fired units over the next decade. 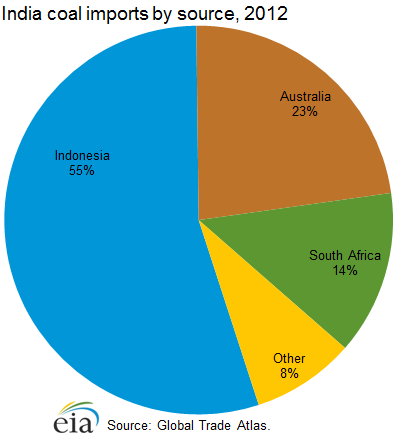 Besides consuming coal, Australia is a large exporter of coal to Asia. Its exports of thermal coal rose 5 percent to 205 million metric tons in the last financial year and are expected to increase by an additional one million metric tons this year, driven by increased demand from Japan, South Korea and Taiwan. 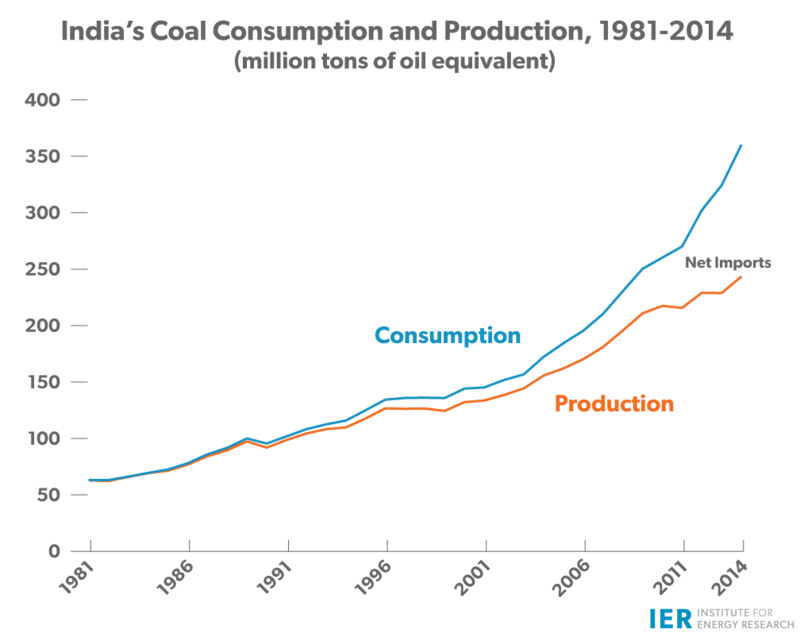 Peak coal production in the United States occurred in 2006. In 2014, coal production was 14 percent lower than that peak. Similarly, peak coal consumption in the United States occurred in 2007 and has fallen 19 percent since then due to competition from low cost natural gas and onerous regulations from President Obama’s Environmental Protection Agency. [iv] As India is opening up new coal mines, coal mines in the United States have closed and thousands of coal miners have become unemployed in the coal producing states of West Virginia, Kentucky, Colorado, Indiana and Utah. Coal production in Central Appalachia—mainly southern West Virginia and eastern Kentucky– is forecast to decline to half its 2010 level by the end of the current decade. Since 2000, coal production in eastern Kentucky declined by 63 percent. According to state data, coal mines in western Kentucky are preventing a general collapse of the state’s coal mining industry, with coal production at its lowest level since the early 1960s. Coal production from the state’s western mines overtook those in the east in 2013 for the first time since 1911. In eastern Kentucky, coal mining employment dropped by more than 7,000 jobs, or 38 percent, since the middle of 2011, leaving the state’s coal mining employment at its lowest level since 1927. Between 2010 and 2014, 82 underground coal mines were closed– nearly half the state’s underground operations. In late December 2014, Patriot Coal announced it was laying off 670 workers and permanently closing its Highland Mine and its Dodge Hill mining complex in western Kentucky. The Kentucky closures came after Patriot’s decision in November 2014 to lay off 130 workers at its Corridor G mining complex in Boone County, West Virginia. In June 2014, the company laid off 60 workers at its Wells mining complex, also in Boone County, and an additional 15 workers at Corridor G. Patriot emerged from bankruptcy in December 2013 after eliminating its retiree health care obligations and obtaining a concessions contract from its union miners. In mid-December, 2014, Alpha Natural Resources announced it was laying off 10 workers at its Wyoming No. 2 mine in Wyoming County, West Virginia. In November 2014, the company laid off workers in southern West Virginia and eastern Kentucky. Alpha’s Cucumber Mine in McDowell County, West Virginia was permanently idled, affecting 36 miners. A section of the company’s Ruby Energy Mine in Mingo County, West Virginia was shut down, reducing the workforce by 22. Cuts at Alpha’s Rock Spring Development mining complex in Wayne County, West Virginia resulted in 25 lost jobs. The company also idled its Taylor Fork Mine in Pike County, Kentucky, laying off 12 miners, with 36 others remaining on the job just to remove equipment. In September, 2014, Alpha laid off more than 260 workers at mines in West Virginia. The company idled its Twilight surface mine in Boone County and its Ewing Fork No. 1 surface mine in Kanawha and Fayette counties, resulting in 193 layoffs. Alpha subsidiary Marfork Coal Company also idled its Marsh Fork underground mine in Raleigh County and eliminated 68 positions across several other operations. Alpha also announced that it would permanently idle its Emerald Mine near Waynesburg, Pennsylvania by the end of 2015, affecting 500 workers employed there. Multinational steel giant ArcelorMittal confirmed in late December that it had laid off 58 miners at its Concept, XMV and Extra Energy mines in McDowell County, West Virginia. In October 2014, Bowie Resource Partners laid off 150 workers at its Bowie No. 2 mine near Paonia in Delta County, Colorado. The announcement came after the company lost a contract with the Tennessee Valley Authority. In December 2014, PacifiCorp—a subsidiary of Warren Buffet’s Berkshire Hathaway—announced it would be closing its Deer Creek mine in Emery County, Utah early next year. The mine, which feeds PacifiCorp’s Huntington power plant via a 2.4-mile conveyor belt, employs 182 workers and is the only union mine remaining in Utah. India has very cleverly submitted a plan to the U.N. conference that will take place in Paris later this year that allows them to continue releasing carbon dioxide emissions to the point of tripling their release by 2030. China and India’s increase in carbon dioxide emissions will dwarf the reductions in the United States. Yet, Americans are being asked by President Obama to pay higher electricity costs because existing coal-fired power plants in this country are being shuttered and replaced with substantially higher cost renewable plants. According to a recent study by IER, the costs for new renewable plants are around 3 times as high as existing coal-fired plants. [vi] The resulting coal mine closures are costing thousands of Americans their jobs. India and other countries in Asia know that coal is the most cost effective source of generation and are using that energy source to build their economies and to beat poverty in their countries. India, with the fifth highest coal reserves in the world, is opening a coal mine a month and expects to surpass the United States in coal production by 2020. The United States, in contrast, is closing coal mines and laying off workers due to onerous EPA regulations that are shuttering coal-fired power plants in this country and keeping modern, more efficient plants from being built.